One of the best new traditions hits around Christmas time every year when Grant Morrison and Dan Mora get together with BOOM! Studios to tell another amazing tale of Klaus, and this year that story is called Klaus and The Crying Snowman. 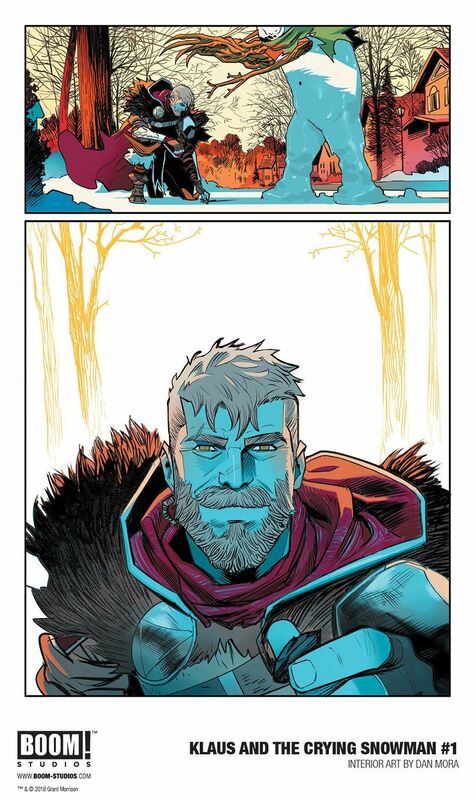 For those unfamiliar with the character, Klaus is Morrison and Mora's take on Santa Claus, but this isn't the Santa you hear about from carolers and children's books. Instead, this take on the character tells the story of what Klaus does the other 364 days of the year, which often involves keeping the world safe with a heavy dose of the fun and fantastical. 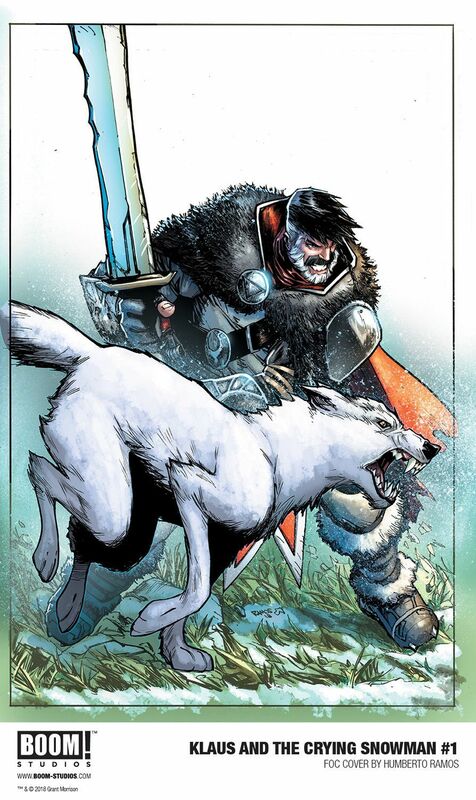 ComicBook.com had the chance to speak to Morrison ahead of Klaus and the Crying Snowman's release, and while this all started with a lengthy look at Klaus in the original mini-series, nowadays it is more about how others react to Klaus. "You know, the first Klaus story was seven issues and we were really able to delve into who he was and where he came from," Morrison said. "But the Christmas specials are much more like it's a hard, fast hit. And they kind of ... they're usually stories of other people and Klaus comes into contact with them, you know, the way I used to do with Spirit. Where it was really a story about some citizen, but then into his life would come this character. So I think that's what's been the yearly, the annual ones, and the sort of longer story." Morrison's got plenty of ideas for the future too, including another longer form idea that would put the spotlight back on Klaus. "Oh, yeah. 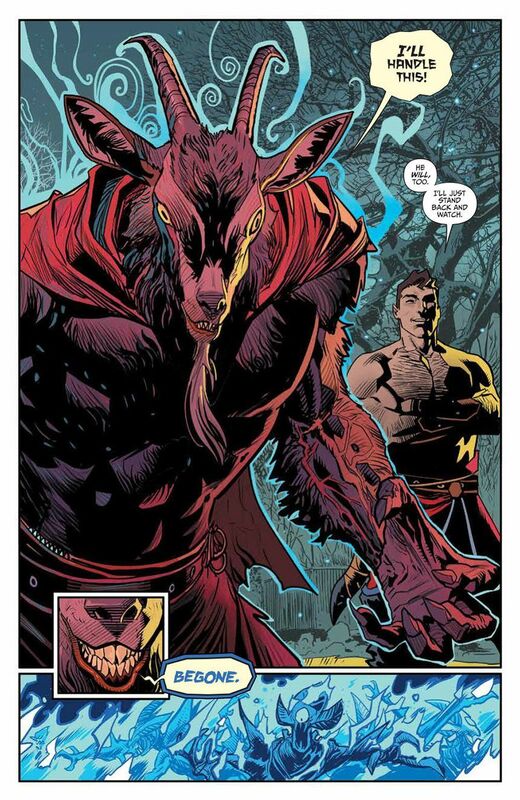 I mean, I've got a ton of Klaus stories," Morrison said. "I've got a folder filled with these things. And yeah, there are a couple of the ... there's more one-offs, but there's also something that I would really like to just delve into having him as a character again and to see kind of his life over the centuries. But I don't know where I'm going to start on that one, but I certainly... I'd like to go back in depth on him, and I think I find him pretty fascinating, really." Hit the next slide to find out more about what Klaus and The Crying Snowman is all about! As you might interpret from the title, The Crying Snowman does involve a snowman, as well as a very personal tale underneath all the holiday imagery, which was sort of the point. "Well, it just seemed to be a fun thing to play it, but it was kind of Christmas themes and tropes," Morrison said. "You know, in the first one it was about the Witch of Winter, and the second one was this sort of tone that was corporate version of Christmas. So it was just different kinds of scenes. And the last one had been a bit, you know, it was all about like there's nothing in corporations. This one I wanted to be much more personal. And I liked the idea of the kind of Scrooge story as well where Klaus comes in and shows, basically, a bad man the error of his ways, hopefully. We'll see what happens." Morrison also just happens to love snowmen, but there's also some growth for Klaus as well. "So there was that, and I just loved the idea of the snowman," Morrison said. "It just seemed such a great nature of, you know, life, how brief life can be if we don't take it seriously. And so it's a lot more a personal story and a lot more about the main character. The other ones, I think, were much bigger kind of ideas. This one's, I think, one that people can really understand. And it is about forgiveness for Klaus as well, something that I think makes him different from all the other superheroes." Klaus and his friends find themselves face to face with the Nightborn, who fans of Norse Mythology might recognize. "It seemed like they were the ultimate winter villains," Morrison said. "You know, they're creatures from Norse mythology, they draw about the symbol winter in Ragnarok. Great stuff. Some Norse mythology. So it seems like they're really big villains, but, you know, then frankly, they're on the small-scale story of the snowman, and kind of reflect them and reflect also the way that Klaus deals with intimate problems and giant scale problems." While they are the villains, that doesn't mean they aren't necessarily worth listening too. "There's maybe things that we can learn by paying attention to other voices, so it was kind of that as well," Morrison said. 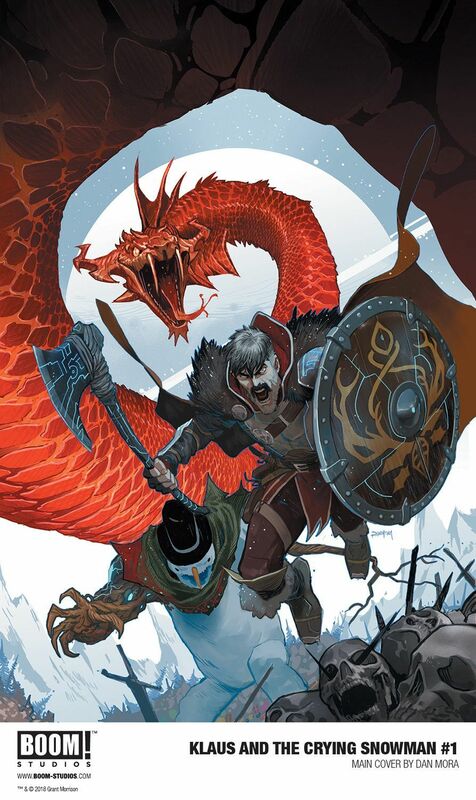 Fans will find a variety of unique creations in the Klaus series, and The Crying Snowman is no different, including one memorable flock of attacking flying bagpipes, though some parts of the book were a little less detailed than they could've been due to the sheer amount of time it would take Mora to draw them. "Most of it was there," Morrison said. "I mean, I've could've gone in more detail on the clockwork planet or something, but then, when I saw Dan's drawings and they were so well-done ... He wanted to sort of draw just a couple of things, but you have to draw a hundred things with all those gears and clock wheels. So yeah, it was a lot of fun to shift in locations really fast in it, as you see. And again, it was just being able to give Dan stuff to draw. So there wasn't a lot left on the drawing board, although there were some sequences that may have gone on longer if I hadn't realized it would take forever to draw." 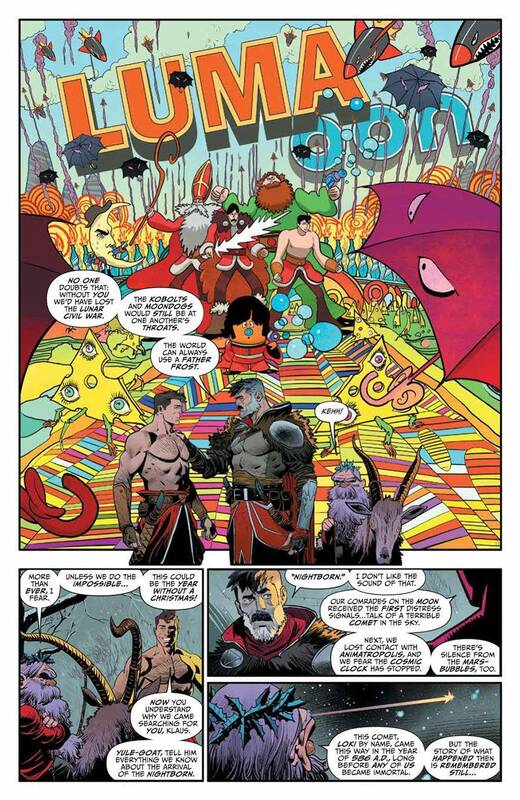 Artist Dan Mora delivers some simply stunning sequences in the book, and Morrison believes part of that comes from Mora really understanding what Klaus and this world is all about. "One of the things he brings is he really gets it, you know? 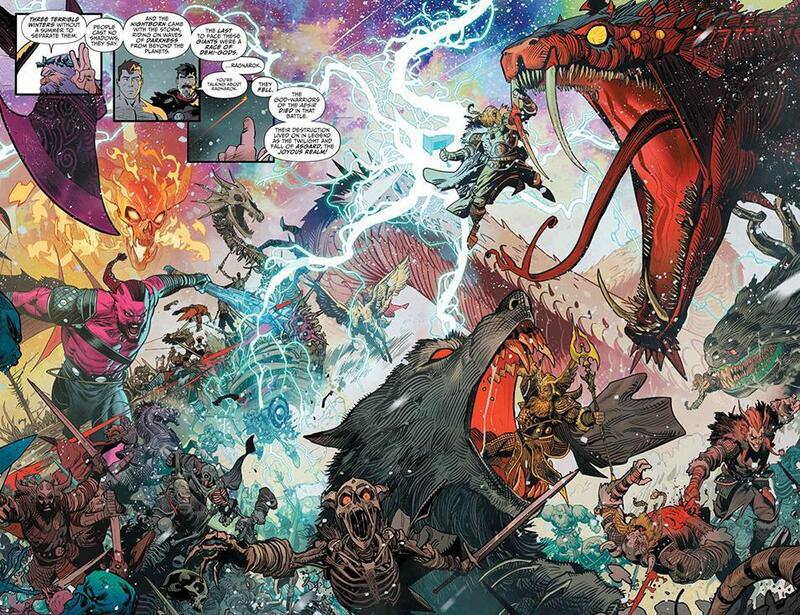 I've sent some quite extravagant panel descriptions, as you might imagine, and asking an artist to draw like mosquito bagpipes with wings attacking and you know, like probes in the sun, that's quite nuts," Morrison said. "And that will all be written down and described and then Dan just takes it and give you that fantastic ... and literally these things are suddenly believable. So it's ... the understanding you appreciate. I've got a bunch of artists I can really, they get what I'm trying to do, and then they do it better. That's how it's been with Dan, and especially on this project. "This has been together with him since the start, so I can't imagine anyone else but him doing it," Morrison said. "Each year's just tailored ... you know, to see the way the stuff is there, and the designs, and each year he switches up his work. He makes it more fantastic, more colorful this year, I think, than before." 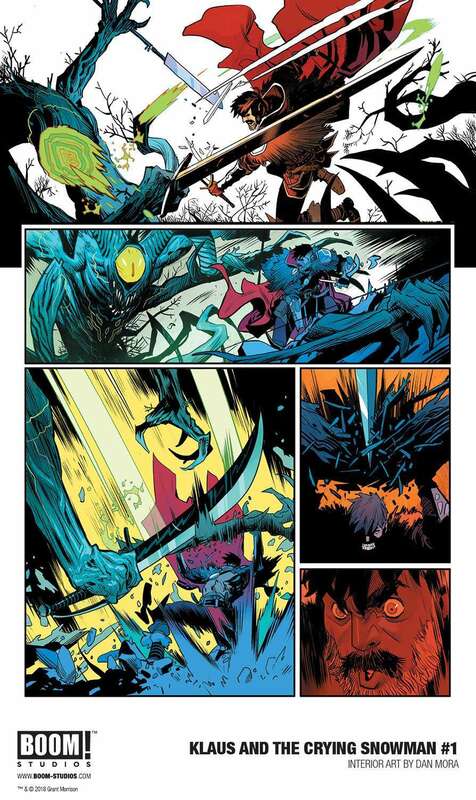 Every page Morrison gets from Mora is another win, but he does a few he favors more than others. "Some of the ones that I love the most are those snowy scenes where it's like Klaus and the wolf are walking through these kind of wintry, you know, just on the outskirts of the suburbs, and he sees a bear," Morrison said. "It's just fantastic, evocative images. And every page has got something like that on it, you know, but then in completely different way, so I can't praise Dan highly enough. I think he's just amazing." The book understandably focuses on Klaus, there are several other memorable characters that fill out his world, and each one of them has the potential to hold down their own story if the opportunity arose. "No, I mean, there's obviously the potential for it," Morrison said. "You're trying to make these kind of secondary characters as interesting in their own right. I definitely want to do them all together. You know, the kind of League of Santas at some point. But I'm kind of ...for me it's all about Klaus 'cause it couldn't be a Superman story. He would do different things, he would throw the snowman in jail, probably, for being such a cheat. And Batman would be even worse, but Klaus is very different. So even though sometimes he's not the star, he's not the funniest one in the scene, I think to me, it's all about that kind of energy of that character that goes through the whole book. So yeah, I'm kind of ... He's always there and he's always at the forefront and drives everything on." Morrison's also already got a few ideas for next year's book too. "Yeah, I mean I've got a bunch of options that I've just decided," Morrison said. "You know, the nearer the time comes to start sending pages in, I'll see which one most appeals. Yeah, there's a bunch of stories that I'm kind of really keen to get to. So it just depends which one wins the race." While the world is definitely Christmas inspired, that isn't necessarily what keeps Morrison coming back to this world. For him, it really starts and ends with Klaus, who is more of a superhero than a Christmas give giver. "Well, the reason I come back is not so much the Christmas, which was kind of the dressing, it was because I kind of touch on Santa more as a superhero story," Morrison said. "And you know, since I started Green Lantern recently, I haven't been doing a lot of superhero stuff, so Klaus was almost my way of dealing with the superhero tune. I think all the Christmas stuff is actually, as I said, you know, Santa's got his sleigh, but that's could just as easily be the Batmobile. But you know, this like ... Superman's got his Krypto, Klaus has got his Lilli, so it was kind of taking all the Christmas stuff and using it as the framework. Superheroes ... You know, Batman's got bats, Klaus has got Christmas. So there's kind of ... that's the basic idea why it's fun to just go into all the Christmas lore and find new kinds of ways to update that and make it fit into the kind of weird world of Klaus." Speaking of Lilli, Klaus' right-hand wolf is one of our favorite parts of the series, and we absolutely made sure to tell him we want a Plush Lilli somewhere down the line. Morrison seems game for that as well. "That would be great! Yeah, I kind of want to give her more of a kind of front and center in the next story as well," Morrison said. "Cause she's been a bit background in these stories, so I think it's time she got ... No, a plush would be great. There can never be enough plush animals." Mora is also known for his incredible work on Go Go Power Rangers, and we had to ask Morrison what his take on the Power Rangers would be. Sadly he isn't that familiar with them, but you can definitely imagine what a Morrison spun Ranger would look like, right? "I mean, I was kind of too old for Power Rangers, so I don't know much about them at all," Morrison said. "It might as well be the Powerpuff girls, you know? So I'll have to do research on that one. I'm sure Dan's done a brilliant job, and he's way more in the generation who would kind of knows their ins and outs on that one." 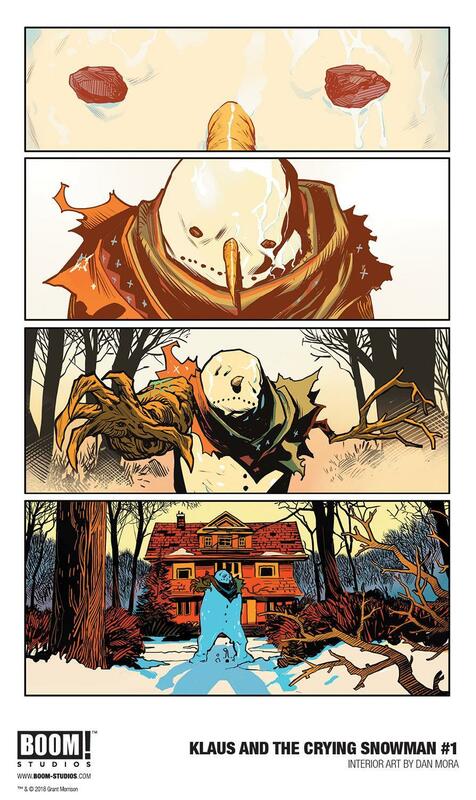 Klaus and The Crying Snowman is in comic stores on December 19th.